Not to imply that racing is in any way a safe sport today… but it used to be much less polished, and your average driver took significantly fewer precautions in running a track than today. That’s what makes this video of a supercharged C5 Corvette running the CDS Farms & Motorsports Park road course in Fayetteville, Arkansas rather unique: there is not much runoff, no safety barriers, or any safety cars (forget about choppers) waiting for an unfortunate turn of the wheel. Previous story Community Question: Chevrolet Camaro ZL1 Or Cadillac CTS-V Coupe? NO helmet on the driver, either! And the “pits” (including parked cars, a tractor, a building and people standing around), are almost right on the track! That track doesn’t look much safer than you favorite back road! 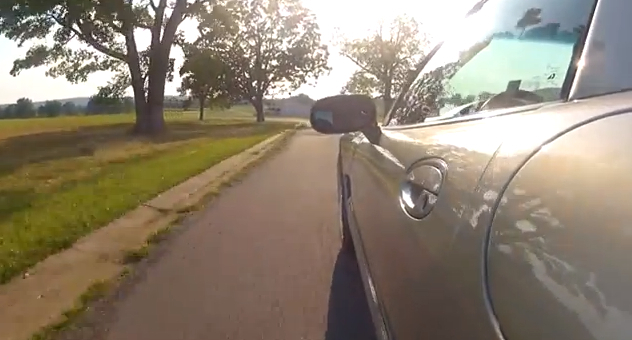 Speaking of a long stretch of winding road, the car, and the driver… my husband got a new used car recently, a Dodge Magnum SRT. I drove it the other day and immediately wished we had an Autobahn in America somewhere, like they have in Germany. I’m not crazy about the vehicle’s bodystyle, but damn that thing’s a rocket ship! Now I know why they say “It’s got a Hemi.” Just sayin’ Sorry for talking about non-GM. Have a great day!